It is probably every marketer dream to win an award at Cannes Lion, or at least that is my dream. And so when I read the report from R3 about which country/agency won big at Cannes Lion this year, it made me pause and wonder how they could achieve the results as a country, as big networks? Does country with the most number of awards spend more on marketing in general? While Japan might not win as many awards as Australia, it certainly won more Grand Prixes and Gold Lions. Japan receives the same number of points as India, New Zealand and China combined. 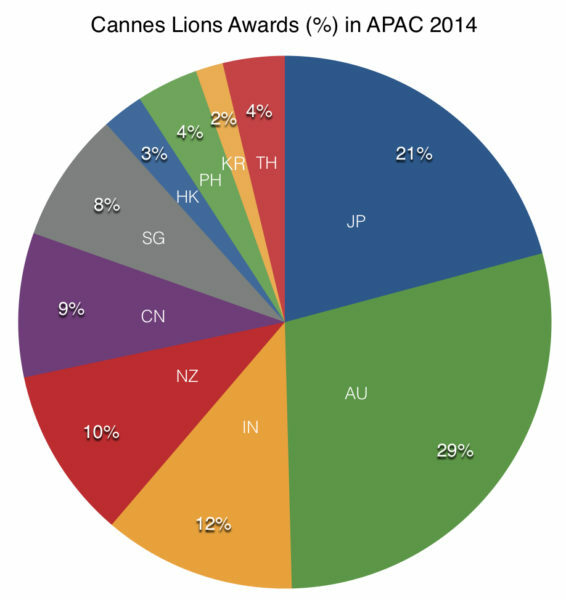 As for the number of awards, Australia, Japan and India gathered 62% of all Cannes Lions awards this year. This shows the incredible level of creativity amongst the top countries. As for agency networks, Dentsu leads other networks by a wide margin. First of all, the use of the word “cost” is not accurate as I don’t know how much winning brands spent on their respective campaigns. However, what I am after is trying to understand if it’s true that the bigger markets in APAC in terms of media ad spend also bring in more awards? So a proxy that I could find is total media ad spend per market divided by the number of awards won. I got the media ad spend based on eMarkter “Global Media Intelligence Report 2014”. The graph below shows the differences between main countries in billion US$. Regionally, China, Japan and Australia are the top 3 countries in terms of media ad spend. 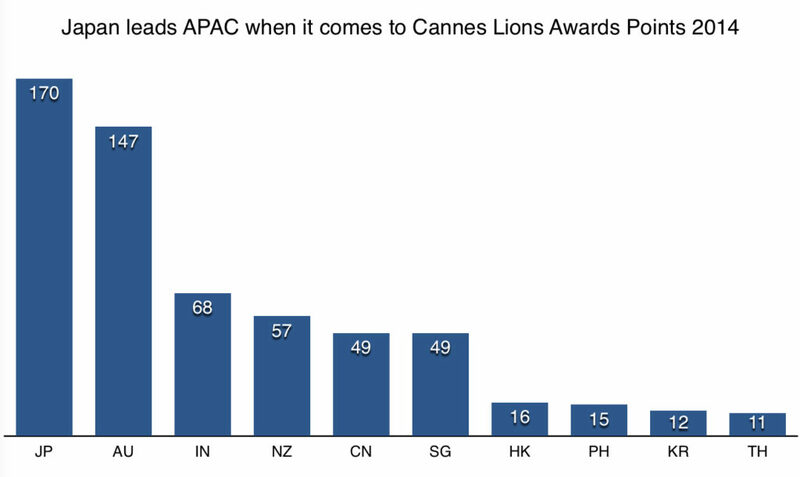 However, it seems that Australia and India “outperform” Japan and China when it comes to “efficiency” in getting Cannes Lions awards. Do you agree/disagree with what I have above? Feel free to put your comments below.